Small traditional purse in heart shape with edelweiss detailing. A true all-rounder with alpine flair: The traditional bag from the P.S. Schuhmacher collection in Saddle Bag design is indispensable for parties and occasions and can be taken anywhere thanks to the practical size of 16x11x5 cm. With the magnetic closure, it can be closed quickly and safely and offers enough space for all the essentials, such as make-up bag, car keys, wallets, etc. The long shoulder strap is adjustable - so the bag can be worn over the shoulder or as a cross-body bag. 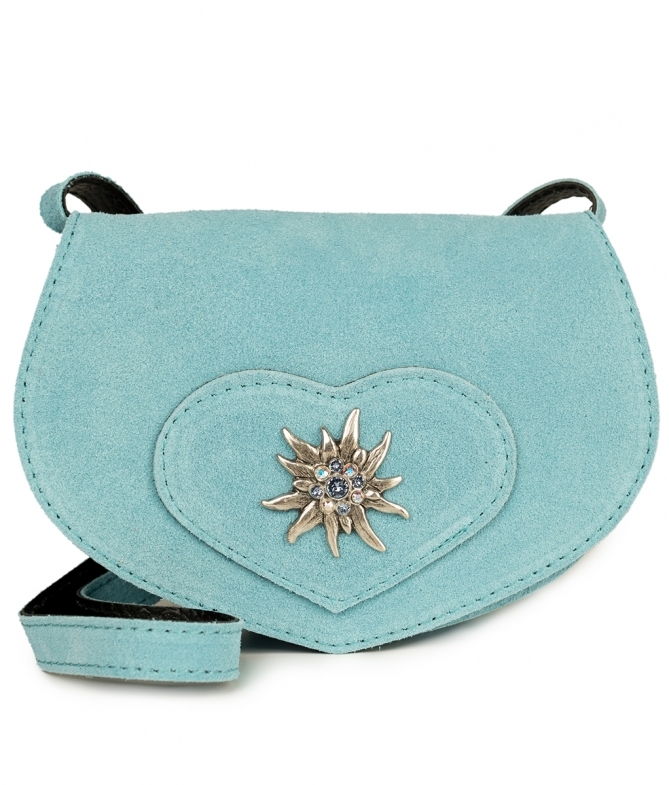 Not only the rustic-elegant rawhide in summery light blue but also the large, silver-coloured edelweiss in antique look, which gives the small crystal stone in turquoise and blue a touch of glamour, ensure the charm of this traditional bag.